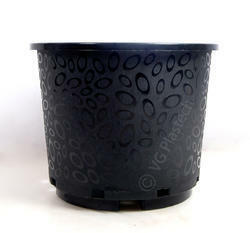 Leading Manufacturer of unbreakable round black plastic flower pot, unbreakable 3 gallon flower pot, plastic unbreakable decorative flower pot, plastic unbreakable black flower pot, unbreakable 7 gallon plastic flower pot and plastic unbreakable 13" flower pot from Surat. 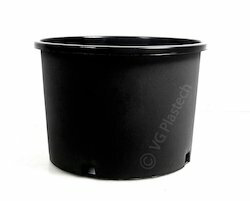 WH Injection Molded Pots are made of Polypropylene plastic with UV protection, and are thicker and more durable than standard thermoformed or blow molded pots. 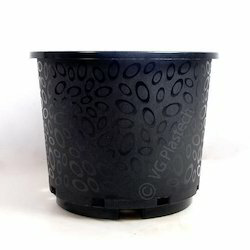 These pots have graspable rims for convenient transportation. 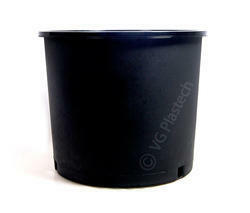 Sturdy and economical containers for growing and shipping containerized nursery and greenhouse stock. Strong enough to meet every grower's demands and inexpensive so your margins are protected. We are a young and energetic manufacturer of hand tools, garden tools, power tools, homelife products export, etc. 1) We have a dynamic export sales team with an export sales experience of more years, which ensures the effective, efficient and satisfying communication and service to customers. 2) We have a daily production capacity of about 10000pc kinds of hardware tools,We have own factory with more than 10 years of professional production experience. 3) We have an innovative researching team, who innovates many brand-new models of hardware tools each year. 4) From boss to workers we have the same quality idea, which makes us have reputable quality fame in the industry and among customers for our products. 1) We attend Canton Fairs and many other overseas trading fairs. 2) We advertise on Google, indiamart, alibaba and Made in india at the moment. 3) We train our sales staff and working staff each month. 4) We have effective work team,our sales teams has a meeting each week to analyze customers and solve important problems. 1)Deliver the goods with speed and safety. 3)New product support preferential,and technology support continuous. 4)Within 24 hours response to customers' any queations. 3)New product support preferential,and technology support continus. 2) We advertise in india at the moment. 2) We advertise on, and Made in india at the moment.